We started the fall season by hosting a LabView Programming seminar for our team and team 433, the Firebirds from Mount Saint Joseph Academy. Programming is expected to be of increased importance next year after the introduction of the Microsoft Knect system in the 2012 game. We participated in 2, one day, competitions. At the GirlPower competition, we made it to the finals but had to settle for second place. GirlPower is a unique competition. The boys take some time off and let the girls drive the robot. In addition to participating in the competition, our team volunteered before and after the competition to construct and tear down the playing field. Here is a picture of our drive team from the event. At the Duel on the Delaware competition at the Salem Community College, we competed against some of the top teams in the area. We missed out on the alliance selection in this competition, but still had great fun. 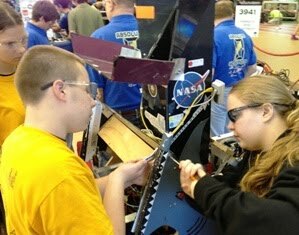 Here are Bill and Jess working on the robot between matches as Sunny looks on. On Oct 24th, McDevitt Alum Norma Hall, Program Director of Information Technology at Manor College, invited us make a presentation to the Manor College Tech Club. We visited last week with SharkByte where we discussed robot design and programming with the college students. Later that same week, SharkByte participated in the school annual Pep Rally. SharkByte competed with the basketball teams coach and point guard in a free throw shooting contest.